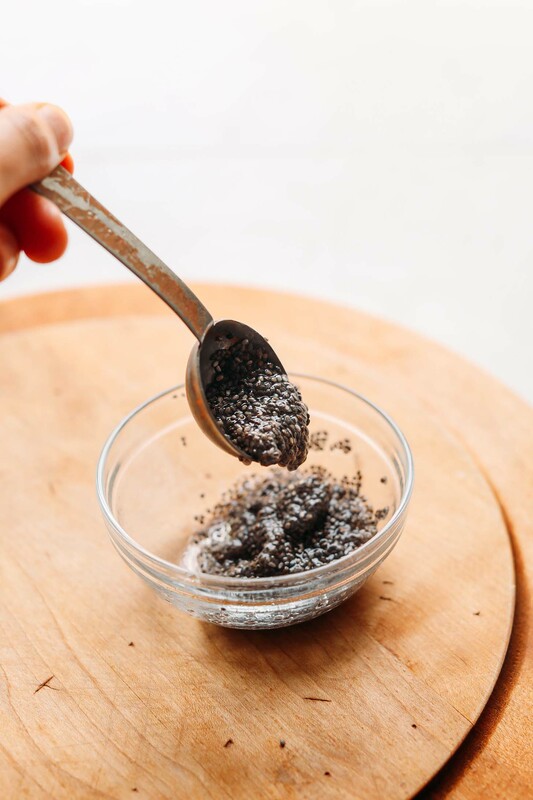 If you’re looking to get into vegan baking, you should know what a chia egg is and how to use it! 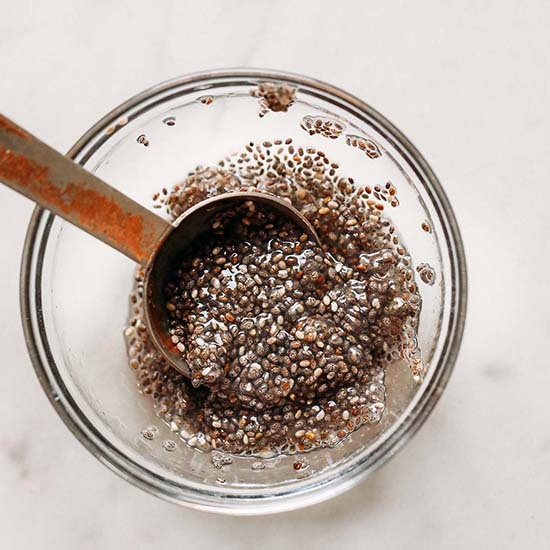 It’s simple – just 1 Tbsp chia seeds + 2.5 Tbsp water = a chia egg. But then what? So many uses! You can use a chia egg (or flax egg) as an egg substitute in many dishes, like quick breads, waffles, cookies, and more! 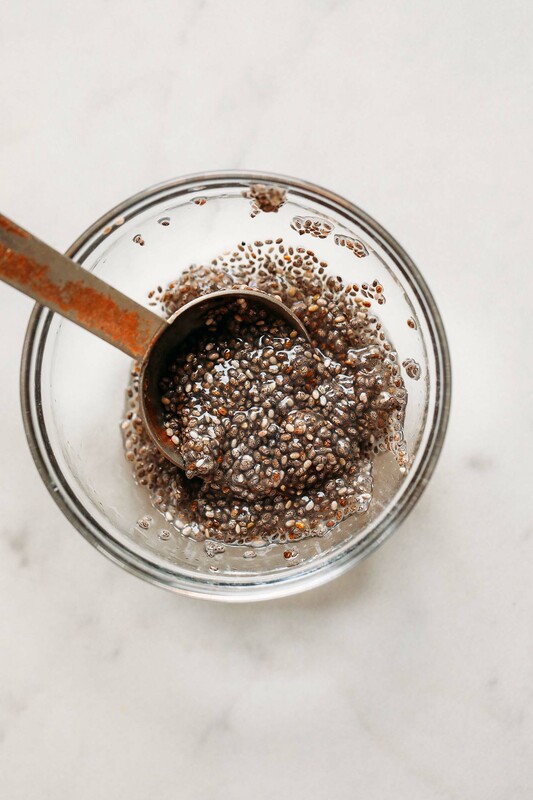 An easy 1-ingredient chia egg! The perfect egg substitute in vegan recipes like pancakes, waffles, quick breads, cakes, and more! 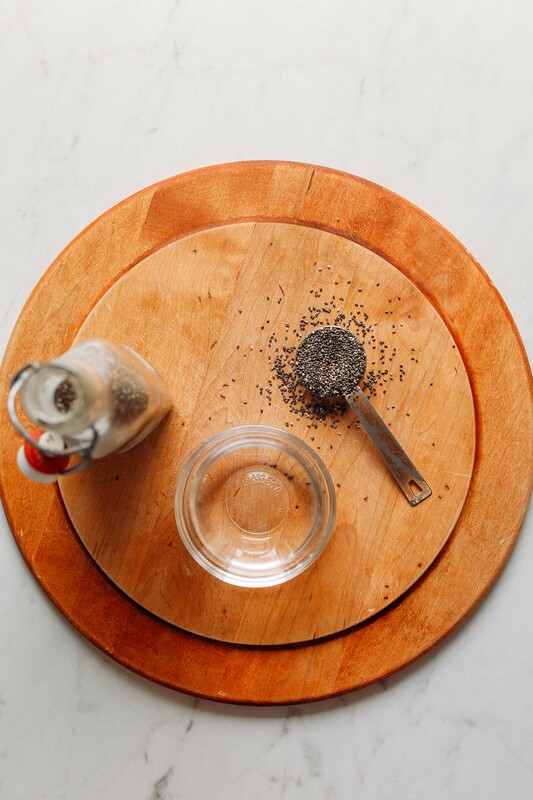 Add chia seeds to a small dish and top with water. Stir and let rest for 5 minute to thicken. It should be gel-like and thick. It's not an exact 1:1 substitution in every recipe because it doesn't bind and stiffen during baking quite like an egg does. But, similar to a flax egg, it works well in pancakes, quick breads, muffins, cookies, and many other baked recipes. Chia seeds also make a delicious chia pudding, like this Chocolate Chia Pudding and PB&J Chia Pudding! *This is not my original recipe, but one I discovered on many vegan baking blogs and have since adapted for my own use. Hi Barbara, yes, you can. We would recommend referring to our post on How to Make a Flax Egg. my product came out extremely gooey. any suggetions on how to correct this? It should be sort of gooey and resemble the consistency of an egg, Bri! Hi there, I just put 2 loaves of a quick bread in my oven in which I used chia seeds for the eggs. The mix was so thick it was almost impossible to mix the wet ingredients with the dry. I finally added some apple juice. I hope I didn’t mess it up, but I did not want a brick. Nothing like closing the barn door after the horse is out, but are there other adjustments that should be made when using chia seeds for an egg substitute? Hi! Bread dough should be pretty thick, but let us know how it turned out! Good Morning. It actually turned out really great. It was moist and spongy, not really heavy or hard as I had feared. I am glad I added the extra liquid, probably not more than 1/3 I think, just enough to make it easier to stir. It was still really thick; it had to be spooned in and spread, not poured. Thanks for the reinforcement of how it should look. I think my grandson will like it. I’ll find out later this morning. That should work, Danielle! Let us know if you try it out. Hi! Is there any benefit to using chia vs flax eggs based on the type of baking? For example, are flax eggs better for cakes, chia for bread, etc? Thanks! I don’t use chia seed eggs and rely on flax eggs more. And also, aquafaba is sometimes more beneficial depending on the recipe but there are no hard and fast rules! It just requires following recipes and also experimenting! 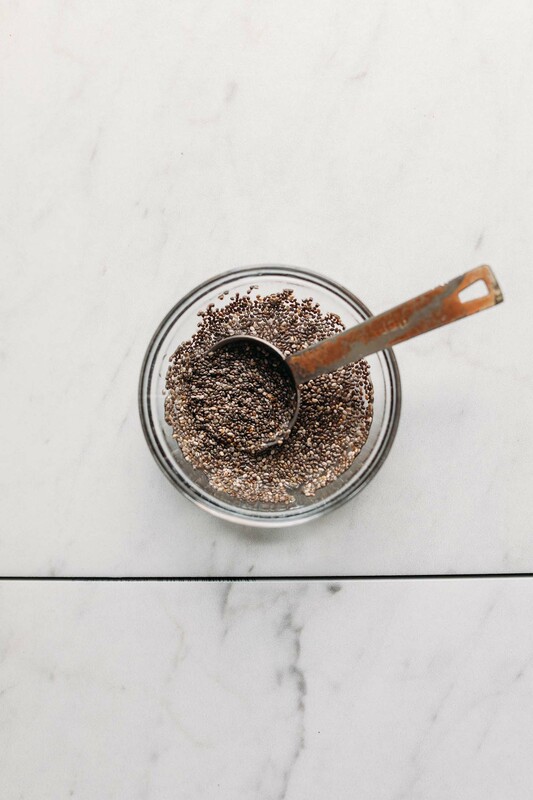 I notice other recipes for “chia egg” grind the seed. Do you agree ?? I don’t think it’s necessary but you certainly can. If I am wanting to substitute 3 egg whites only, not the entire egg, how much of this mixture would I use? Hi Teresa! I’m not sure as we haven’t tried doing that ourselves but if you experiment with it, report back! Can use it as an egg substitute for making mayonnaise? I don’t think that would work, but check out our vegan mayo recipe here! Hey! Wondering if there is an adjustment to make for high altitudes? We live in a town that’s 1,120m (just under 3,700 feet) and chia eggs never work for us, even in pancakes. Every time we try they just stick and stay gooey. Any tips?? Thanks for your awesome site and recipes! Does chia egg in pancake cause it not to cook in the middle and stay goey? Can you use this substitute for cake ? Hi Sheila! Yes you can! you could try oatmeal or millet flakes with your hamburger. That’s what Ive used for years and it has always worked for me. Often when a burger falls apart it’s due to high water content, so try roasting some of the veg or slicing fine and absorbing excess moisture with towels before placing in the burger patty. I personally prefer to bake them on oven paper over frying them which also helps. If you prefer frying be sure not to move the patties other than to turn them. Cook on medium heat. Flax powder also works well to bind burgers, as do mashed chickpeas. How many replacement eggs can be used in a recipe at one time? For example a recipe calling for five or six eggs? Hi! Depending on the recipe it should work. What are you planning on making? Do you think this will work well in a pecan pie as the egg replacer? Hi Suzette! That should work! Have you ever used this in a casserole-type dish? Or is that what it doesn’t work well for? Can you use ground chia meal instead of whole chia seeds for a smoother texture? Hi Maisie! Yes you can!